The Gamers is a giant inside joke told for the amusement of anyone who's ever played a pen and paper RPG like Dungeons and Dragons. I laughed. Many times. 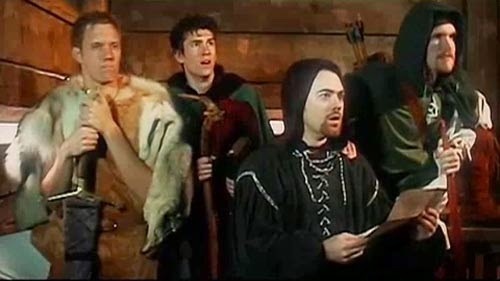 It could also be appreciated by anyone who's ever watched or listened to people play Dungeons and Dragons, because the things the movie makes fun of are pretty clearly funny whatever kind of familiarity you have with the game. Easy: what's funny is that playing D&D usually involves saying and imagining doing some pretty silly things (even if you're trying to be serious) or, at least involves feeling silly about acting serious about pretending to be Fingol the Wood Elf Ranger in front of a bunch of other adults or adolescents. And this film (made by people with clear talent for visual story-telling) hits the nail on the head several times over regarding what that’s like, although it's a bit over the top for effect. In outline, the movie follows a group of college guys during a single night's session of role-playing in their dorm. 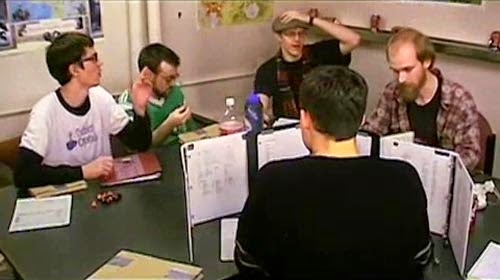 The twist is that each actor plays both the guy playing the game, and his character in the game, so the guys around the table in the dorm become kind of like a committee of bumbling narrators for a cheesy fantasy movie, and the characters do whatever those narrators say, even if it doesn't make any coherent sense. The movie is on sale on www.Gog.com for about six bucks. If you've any experience with pen and paper RPGs, and are up for something goofy, you very well might enjoy it. But, you don't need to watch it to read this article, because we're going to talk more about the underlying themes of the movie than the movie itself. Although the movie is lighthearted fun, it indirectly brings up larger and deeper issues because the experience of playing a game of pretend after the age of ten, the self-conscious smirk at the silliness of it, and the sense of camaraderie with others who have done so, are the foundation of the jokes in the film. That's what we'll be discussing for the duration of the article. Playing D&D is not acting, and it isn't writing, and it isn't exactly a child's game of pretend either. But, all of those things are intimately related to each other, and D&D is related to all of them. Clearly playing D&D is something like a child's playing pretend, because it's a bunch of people imagining that they are other people, in another place, doing things they aren't. But I'd say that, in general, a kid who plays pretend is more like an adult writing a novel (or a philosophical essay) than he is like an adult playing D&D. I say this because kids, when they play pretend, can be deadly serious, while adults have a more difficult time doing this in D&D (if they even try at all). One reason for this is that children don't know very much. Children are in the middle of taking in an incredible number of wonders which will become for them the things they see every day. So, when they play pretend, they are putting together and running mental experiments on most of what they know. When they say, “I'm the knight, and I'm going to kill you, Dragon!” They can take it seriously because this is nearly everything they know about knights and dragons, and they are interested to see what the outcome of this daring maneuver will be. Children are serious and committed when they play because they are blazing trails at the edge of their experience just like Aristotle and Einstein did. As an aside, this is why I don't particularly like Robert Lewis Stevenson's A Child's Garden of Verses. The poems in it tend to draw attention to the fact that the kid is pretending something. The tone is something like, “Oh, I'm a little kid and my room is a jungle, it’s fun to hunt panthers that sleep on the top bunk”. But, when a kid is pretending his bedroom is a jungle, he certainly doesn't want you to draw attention to the fact that he's in his bedroom. He knows he's in his bedroom and he is exerting himself in an effort to ignore that fact, so that he can hunt in the jungle. This makes the poems seem less like poems for children (which would be poems about hunting in the jungle) and more like poems about children for adults who aren't interested in joining the game, but, instead, want to pay attention to how charming children are. Now, if an adult (or an adolescent) were to say the same thing (“I'm the knight, and I'm going to kill you, Dragon!”), he'd probably feel silly. His expectations are much higher for how a knight would act and what he would say, because he knows a lot more – including having a better understanding of the limits of his own knowledge. He knows that a knight is not simply the knight, for instance. Why is he fighting this dragon? Who is his lord? Who is his family? Is he a humble and valorous knight? Is he arrogant? What language does he speak? Is this supposed to be taking place in an historical time-period, or a fantasy world? And on and on. To get the same intensity of engagement as a child playing pretend, an adult probably has to become a novelist. What the kid can throw together in a minute, the adult has to spend hours pouring over. He has to think about his pretend characters and events from a hundred angles and think through a thousand implications, because he is aware of a hundred angles, and he knows that implications abound. But, in D&D, you have to play your character off the top of your head without knowing what the Dungeon Master is going to do next, or what the other characters are going to do next, or whether your die roll is going to work out or not. I'm not saying, therefore, that playing D&D is necessarily a vain pursuit for adults. I'm just saying that one reason adults playing D&D would tend to be a little silly about it is that they are aware of being hasty. They know they're grabbing things off the shelves of the storehouse of ideas and throwing them in the microwave for a quick snack, rather than working all day on an elaborate dinner. This can be a productive kind of mental play perhaps, but it is pretty inherently lighthearted in its playfulness, because it's light as opposed to heavy altogether. The dice-rolling I mentioned is a pretty major part of this relative lightness and bears more discussion. Also, while the attitude of The Gamers is expressive of this knowing nod exchanged between the filmmakers and the role-players watching it, the actual jokes in the movie have more to do with the less than seamless integration of a dice game into story-telling. D&D is not just a way of writing stories with improvisation. It's a game, meaning here that it has rules and a definition of success that only apply within the confines of the game itself. It's played rather than read (although you could think of it as a game designed to produce stories as you play it) because its rules attempt to emulate, in some measure, the combination of skill and effort on the one hand, with factors outside a person's control on the other, that always goes into the actions people take. When the rules work, this makes playing D&D as exciting as reading an adventure story for the first time; will Fingol make it over the chasm, or will the rope break and send him to the uncharted depths below? When you read an adventure story, you usually want the protagonist to succeed, and because of the conventions of the genre, he usually does. But, even if he doesn't, even if the story turns out to be a tragedy, the events of a good story not only follow coherently one to the next, but will be somehow significant or weighty. This is because, although people do attempt things and fail in stupid or unfortunate ways, or do things that simply don't go much of anywhere, we tell stories about exceptional and meaningful events. But, in D&D, sometimes the grim, determined, and skilled elf ranger misses three times in a row with his sword and then falls into a tiger trap, while the half-insane hobbit thief kills the troll by whacking it in the shins with her miniature walking stick. When chance and mechanical rules have a hand in determining outcomes, poetic proportion and harmony do not always result (who would have thought? ); sometimes it's ridiculous. I'm not saying that pen and paper RPGs are simply silly or necessarily ridiculous or shallow. The movie that prompted this article makes fun of the kinds of things that can and do happen in this kind of game and that's what I wrote about. Hopefully what I've written about here can give us some insight into why this happens. And maybe, if someone is so inclined, it can help them figure out how to get something weightier and more profound out of game-night.